I wish they sell more items so I could do all my online shopping using the company. Fastest shipping and I didn't even pay extra for it. I ordered the large buri fans for my guests to use at the ceremony, I added a little personalized ribbon to them and they are perfect! I can't wait to see it all come together at my wedding! The fans were a little larger than I expected but not a big deal. The sizes vary a bit though...some are definitely larger than others and some better quality (better stitching) than others. Overall, good product. Just what we wanted for a beach wedding! We used them at the reception. We were going to use them on the chairs at the wedding but it rained so the coordinator moved them to the tables at the reception. They were great. These are the cutest things! I had bought the personal ribbon which I tied around the handles and handed them out to the guests before the outdoor Florida wedding ceremony of my son. I think it added a nice touch and was appreciated. I purchased this product for my destination wedding favors. I didn't want to buy the large ones, because they will take up more luggage space. Happy with this item overall, but they are even a bit smaller than I was expecting. I really like it. My weeding will be so cute with this! Cute & just perfect for me! I bought these fans for my guests both to use and keep at our wedding ceremony this March. Our wedding is in Florida, and although it (hopefully) won't be entirely to hot that time of year, our ceremony is in an non air conditioned building, just ceiling fans. We have a vintage theme going for our whole wedding and these fans remind me of old-fashioned and I added our color ribbon to them and they are SUPER adorable! I LOVE them SO much! Also, I love how they aren't too big and no two are alike, very unique! This is JUST what I was looking for and so happy I found them for such a good deal. Great Hard to Find Product! This product was used for a "Remember When Event" it fit the bill perfectly. We are having our wedding in a few weeks at a local church which we recently found out has no air conditioning! Being an August wedding, we had to find a remedy quick, so we found these buri fans online and ordered one for each guest to receive with their program. We are so happy with the fans and customer service! We received our shipment shortly after our order and the fans were exactly what we wanted. They are about the size of my hand and can be easily slipped into a pocketbook after the ceremony to be kept as a momento. They also are tightly bound so they work efficiently! Great job Beau coup! Loved these fans! I decorated them with tulle and made bows around handles in all the colours in my wedding party.. Super fast shipping as well!!! Thank you!!!! I was very happy with this product. I set then out for a tiki theme party for people to use and take home. These Buri Fans will be perfect for our upcoming Destination Wedding...I know our guests will appreciate while they are sitting through the ceremony! I was so excited to finally recieve these. They are perfect size that I was needing and will go great with our tropical theme wedding for our outdoor ceremony. This product is going to work great as a gift to fill the beach bags I am giving to our guests. I ordered the large Buri Fans and I could not have been more impressed. Some reviews said they were too small, but that was not the case. They were bigger than I expected and so beautiful! It looks like they were handmade (in the best way) and the package they were delivered in itself was wrapped in tissue like a gift; reflecting the care and effort put into each order. After receiving the fans I came back to order personalized gift tags to tie to the handle with ribbon, much like the picture. Absolutely beautiful. Perfect size for my beach wedding!!! A great favor for guests. A little smaller than I expected, but I measured and the size is what they said it would be. I don't really see the men at the wedding fanning themselves with this so I primarily just bought enough for the women who I think will tend to enjoy it more. It's small enough to fit into the purse which I always find handy. Guests that attend our wedding in Jamaica will each have their own personal fan on their chair. The fans were smaller than I thought. They were all different sizes. Some were so small that I can't use it. And some were not very good quality. The fans were my wedding favors for my garden ceremony. Our daughter is having a destination wedding and the fans will be used as place cards. Perfect on the table and will work well with our island theme. Great quality and perfect size. I liked it but didn't realize how small they were going to be. Everyone else was out of the buri fans so I went with what I could find. Wish it was a little larger. I originally bought these fans to attach to each chair at our beach wedding ceremony, only to find out that they would be too small. I ended up attaching them to the guest's welcome gift bags. They looked very nice and the guest's raved about the overall look of their bags. Ordered for my daughter's beachside wedding to be used as a fan for the ceremony if it's hot and also to double as a table placement. This is a great item, received many compliments on them, easy to personalize and great value. It was hard to find this size fan elsewhere and the price was very affordable. Our church does not have air conditioning, so this was a welcome "favor" in the July heat. I purchased and personalized these for both my daughter's and my nephew's weddings. I wanted to get some fans since I'm getting married in June in the evening just as a light fan but some of them are a lot smaller than the others ones in the same package so I was a little bit frustrated with that. I loved the mini buri fans. They are small but I thought they were the perfect size. I used two ribbons in our wedding colors and tied a bow around the handle. They looked great and helped cool our guests in the Maui heat. Great purchase! 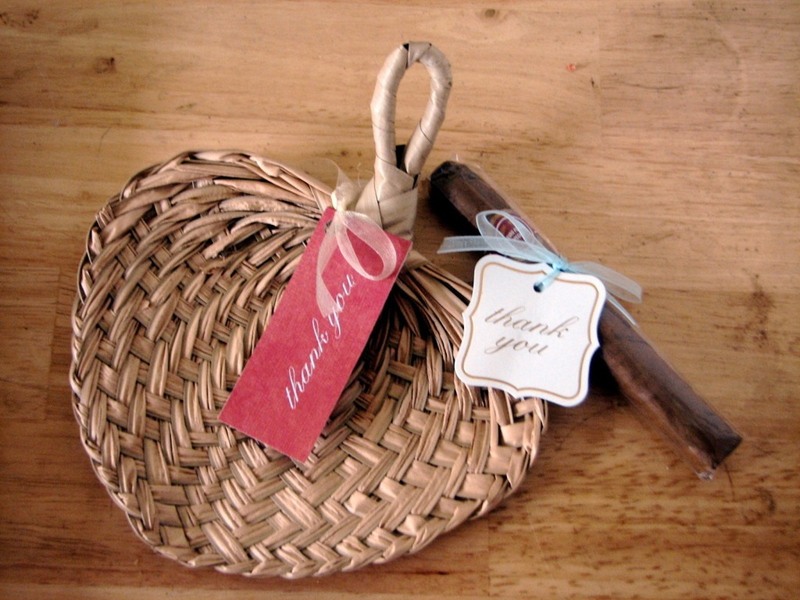 Great for wedding favors but unfortunately they are not standard in size! Help your guests keep their cool! Beaucoup had the 5" fan. Most sites only have the larger 10" fan. Would definitely purchase them again! When they arrived, they were much smaller than expected...about the size of my whole hand (from fingertips to palm). But they worked out well anyhow and turned out to be a hit at my friend's bridal shower. I used these for my wedding and handed them out before the ceremony started. They're small, about the size of your hand. They worked, but I was a bit disappointed because they're not all exactly alike.Some were a little "tweaked", but all in all everyone liked them, because they could put them in their purse and weren't too bulky. We got married in Mexico. 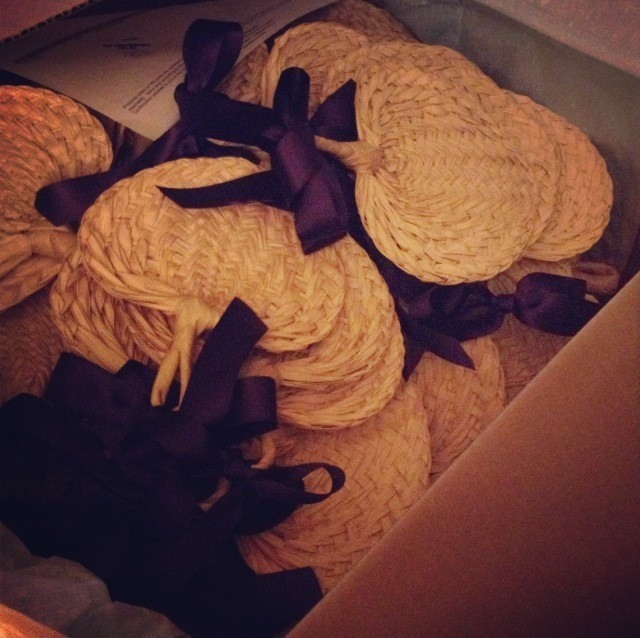 The fans were placed on each of the guests seats prior to our ceremony (which was on the beach). We attached personalized tags to each fan. The fans were used by all of our guests and made beautiful favors! The fans are a great quality for the price. I was not aware that all of them slightly vary in size. Overall, I am satisfied with the purchase, but would have been more thrilled if they came in one standard size. 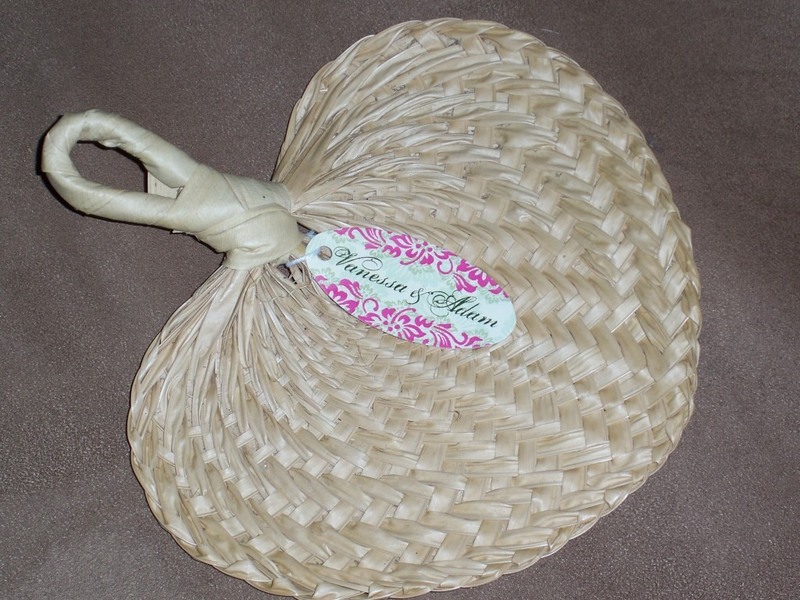 We used these fans as both place holders and favors for a hot July wedding; everybody loved them! We plan to tie a ribbon bow at the base of each fan and set one on each of the white chairs for guests to use during the ceremony. Our wedding is on the beach in South Texas two days before the summer solstice, so the sun will be out in full! We're not fond of the sand and starfish theme so we've gone tropical, and these fans are a perfect match. They're on the small side, but they will definitely work to stir up a breeze for half an hour! I purchaced 100+ fans. They range in size from 4 to 7 inches, not the standard 5 inches as listed. They will work, but won't be uniform. these mimi fans are great especially for summer wedding, or beach weddings, they are very affordable too!! some were better quality than others in the box and they were much smaller than as seen on the site. I am using those as card holders and they are just the right size for that but also if guests really want to use them as fans. The only thing I am disapointed in is that some are looking cheaper than others. But for the price, you can't go wrong. We are getting married in Temecula, CA and it could be avery hot day. That is why I bought these. I love the size, there small but work just fine as fans. They are vary in size slightly, which I knew when purchasing. There perfect so keeping our guests cool. These fans will be part of our wedding favors for the female guests. We will have a beach-themed (southsea-themed) wedding. So they fit perfect! I hope our guests will love them as much as I do! It's not big enough to be useful as a fan, but is very cute for decorating! Great value and really cute! The mini buri fans are my favourite! They look great and are inexpensive to buy. And, they fan really well! It gives a great breeze which will be perfect on at a hot ceremony. If you're having an outdoor or destination wedding I highly recommend incorporating these fans into your wedding. Love them! Not as thick and durable as I'd like, but will work perfectly! OMG...I Speechless :-) These fans are just the right size for what I wanted... [...]. Customer serive is GREAT... OMG I could go on and on. I really really like them.Thanks Beau-coup! These fans are perfect for our late afternoon beach wedding. I also bought the customized ribbon to attach to the fans for a personal touch! We got these to hand out at our wedding in April in Costa Rica. We'll be attaching colored ribbons to them. They were exactly what I was looking for! Do note - that they are small (hence, "mini"), so don't order them expecting a large fan. Mini fans are a BIG hit! We used these mini buri fans with personalized hang tags which we also ordered from this site and they were great! I've included a photo of how our fans turned out after we attached the personalized hang tags (which by the way, matched our place cards also ordered from this site!) Our guests actually used these fans-which was the whole point since we had an outdoor wedding in Puerto Rico. People loved having a personal air conditioner that doubled as a cute favor to take home! We are using these for our wedding in Mexico. We wanted something small that would be able to travel well, and we love the look of them! Many fans that we found were more of an oriental look... They were exactly what we were looking for! Q:Why can't I order more.. I needed to order 50 total for a grad party but limit is5. How can I order if I can want this amount? A:This item is discontinued and that is the amount that we have left of this item to sell. Q:How tall are the fans when rolled up? That is if they are 5'-6' wide, how tall are they generally? Q:The measurement of the fan is lengthwise AND widthwise? Nothing evokes a tropical ocean breeze like these woven buri fans. 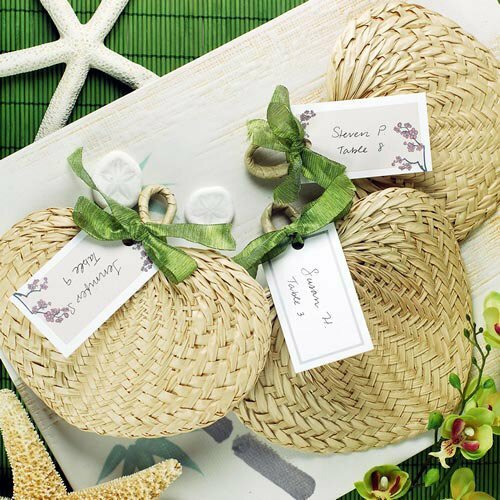 Whether you're planning a tropical-themed wedding, beach wedding or any outdoor event in the spring or summer, these practical favors will keep your guests cool and comfortable. Complete this summer wedding favor with a personalized hang tag or some personalized ribbon tied to the handle. Customize with the couple's names or a special message to guests. To really beat the sultry summer heat, pair these fans with customized water bottles and paper parasols.